Let me admit, right off the bat, that I love boundary work because every day starts and ends with a bushwhack. This summer, I’ve punched through pockets of spruce-fir, scaled 500 foot ledges, and walked cleanly through open hardwood forest. I have the scars on my hands, the holes in my shirts, and, embarrassingly, maybe still the spruce needles in my hair, to prove it. I also love boundary work, because it is a different relationship with the land. As a steward, I have been involved in countless trail work projects, composted a thousand gallons of human waste, and spoken openly with the public about the work I do. Yet boundary work is a different kind of land conservation, protecting a well-defined line of public land in the middle of some of the most volatile lumbering operations in the Northeast. Through a coordinated effort between all arms (Pro Crew, Camp Dodge, and the Shelter Caretakers) of the Trails Department this summer, we managed to reclaim 5 ¾ miles of boundary along the Appalachian Trail in the Mahoosuc Range, on the eastern side of the range, from Gentian Pond to Cascade Mountain. The Mahoosucs are unique in the White Mountain world, since they are mostly private owned land. There are no Wilderness Areas, no large tracts of public land, although recent conservation efforts will hopefully change that in the next few years. There is a thin ribbon (1,000 feet wide) of the Appalachian Trail, a thin corridor owned by the Park Service, and it is that ribbon that a surveyed boundary line protects from encroachment. In the past five years, the AMC, in partnership with the Appalachian Trail Conservancy, has made a concerted effort to reclaim this boundary line, which has been left mostly un-maintained (with the exception of a few dedicated volunteer adopters) since it was first surveyed twenty years ago. 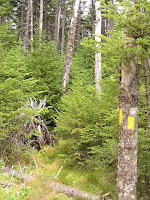 Small boundary crews have managed to reclaim the boundary line from the Maine State line to Gentian Pond (roughly 5 trail miles), with the most recent boundary crew working in 2007. What it means to reclaim the line is to repaint blazes, cut trees in order to see those blazes clearly, and locate monuments that mark the trail. The mechanics of boundary work seems like an antithesis to what we’ve been trained to believe about trail work. We spend the days cutting down trees (rather than preserving them), painting blazes like crazy (rather than sparingly), and stripping moss off rocks to find survey monuments (rather than controlling erosion of thin topsoil). Following segment maps to trace the line, we repaint blazes; a set of monument maps aid us in locating aluminum monuments, spaced roughly 500 feet apart. This surveyed line does not behave like a trail, climbing straight up rock walls, through boulder fields, and traversing above dropoffs that make me nervous; this line follows the reason of surveying, not the reason of treadway. 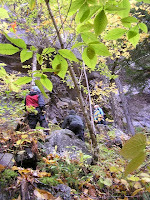 Near Cascade Mountain, I crawled carefully to an isolated blazed line tree, perched in the middle of an exposed steep ledge. I tried not to look down. Boundary work is also very slow. The line can be buried in an impenetrable spruce-fir thicket, difficult to follow in open hardwoods with faded blazes on peeling birches, and, als o, dumbfoundingly scaling 800 feet straight up a cliff (as it does around Gentian Pond). Monuments can be challenging to locate, buried under twenty years of duff, sometimes a solid foot underground. A crew can claim as few as 300 feet a day (a spruce thicket compounded by a fir wave) or as fast as 1,000 feet a day (in open hardwoods with less to cut). First out on the boundary was the AMC Pro Trail crew, in July. Interested in some lighter work for their “All Crew Days” (when the entire White Mountain crew gets together for two days of trail work), they tried their hands at boundary work, with guidance from me and from their capable trailmaster. With the enthusiasm for work our crew is known for, the sixteen of them barreled through 1 ¾ miles of boundary line in roughly eighteen hours. This crew cleared from Page Pond to Cascade Mountain, leaving me to do the blazing and monument finding. The next crew was the Camp Dodge crew, in last August. This crew reclaimed 4,000 feet of boundary line, moving north from the Dryad Falls trail towards Gentian Pond. Labor Day weekend saw a visit of the volunteer corridor monitor for the section between Dream Lake and Page Pond, Ray Brassington. His work is a vital contribution to connecting the boundary line this season! The final crew was a group of five caretakers (plus myself for three of the four days) from the AMC Backcountry Campsite program. We started where Dodge left off, and moved northward towards Gentian Pond, through spruce and fir and down (and up) cliffs. With this final push, through hail, hypothermic rain, and occasional hints of blue sky, the reclaimed corridor line was connected to where our 2007 crews had left off, at Gentian. It was connected at a monument poised at the lip of the cliffs surrounding Gentian Pond; standing on that surveyed line, cut and blazed clearly, I felt the weight of that connection. We have an uninterrupted reclaimed line of over ten miles on the eastern side of the Mahoosucs, from the Maine State Line to Cascade Mountain. The fact that this was such an extraordinary display of coordination, among various parts of the Trails Department, makes this accomplishment even more satisfying. To end on a personal note, I said that I loved boundary work because every day starts and ends with a bushwhack. I’d like to recount one day in particular. I spent two days in August alone in the woods repainting blazes and finding monuments along the 1 ¾ miles that the Trail Crew had cut. These days were sunny, crisp with early fall air, and some of the first days that I wore my wool coat to work. 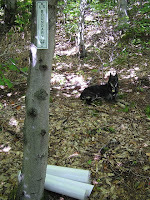 I had a paint bottle in my pocket, boundary signs poking out of my pack, and laminated survey maps catching on branches. These were good days. This section of boundary line starts off flat and gentle, down around Trident Col. Working south from there, the line starts to climb, then things become cliffy, the open hardwoods become thin-soiled softwoods, and it was somewhere around Cascade Mountain that I encountered that solitary blaze tree I described above (which I painted, perched carefully on the root system and really wishing there was someone to take a photo). Those days, I would work until 6 to get the most of the daylight. On the day in question, I worked until 6:30, to reach just one more monument, to reach one more corner, and rehang one more boundary sign. At that last monument, I put the paint bottle back in my pack, securely lashed down those massive laminated maps, and looked up at the ledge in front of me. And started climbing. The benefits of bushwhacking are seeing new places, open and wild and with a semblance of the pristine, that we don’t get with a trail. Somewhere between where I left the boundary line, and where I met the trail, was a glorious open ledge, looking out to the valley, where maple trees were beginning to burn red, where the sky was cooling to dark blue, and the clouds were yellowing in evening light. I had spent the day in tough terrain. I had located monuments and reblazed an important line. I had paint on my hands and a bruise on my shin. I paused and smiled. The breeze picked up. And I kept climbing. That’s life on the edge. A mix of dedication, fearless tackling of tough terrain, and, literally, standing on the edge of protected public land. As a steward of it.